The beginnings could hardly have been less auspicious. Around the turn of the century a Hungarian countess toyed with the idea of taking the lead female role in a steamy new naturalist drama by the Catalonian national playwright Àngel Guimerà (1845-1924). The play, Terra baixa (Lowlands, 1896), had become a pan-European sensation, and the countess sought a German translation from the seasoned Viennese man of the theater Rudolph Lothar (1865-1943), who promptly provided a workable German version. But before the play could reach the stage, the countess had married, and her husband forbade her from appearing in public in such a morally compromising role. The project foundered, Lothar accepted a flat fee for his work, and that would seem to have been the end of it. But the play was then circulated among Germany’s theaters for possible marketing. One of its readers was the redoubtable Ernst von Schuch, the general music director of the Dresden Court Opera, who recognized its value as a potential opera subject. Schuch managed to interest the Anglo-German composer and pianist extraordinaire Eugen d’Albert in the project, and a libretto was sought from the same Rudolph Lothar. It being his first work for the opera stage, Lothar worked extremely slowly under the close supervision of d’Albert, who already had six operas to his credit and was impatient to create his seventh (he went so far as to offer Lothar 50 marks for every day that the libretto appeared in advance of deadline). Even before the libretto was complete, d’Albert had already embarked on the score (the earliest musical sketches date from 22 April 1900), and by 24 July he had finished the bucolic Prelude, which Lothar had freely invented to make Guimerà’s starkly realistic play more suitable for operatic treatment. While waiting for the libretto d’Albert sought expert advise on Catalonian folk music from a reigning authority, intending to lend his opera a touch of musical naturalism comparable to the rural setting of the play. 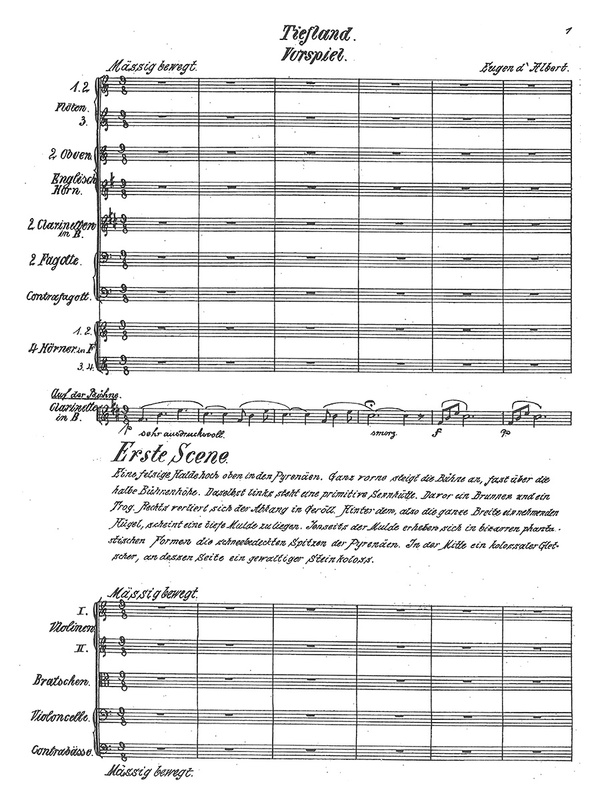 Finally the full score of the opera, in its initial three-act version, was complete and ready for performance on 2 July 1903, and d’Albert made the rounds in search of theater directors and publishers willing to take on his newest work. None were forthcoming in Germany. In the end he was able to interest the impresario Angelo Neumann (1838-1910), who had acquired a reputation for fearlessness with his traveling production of Wagner’s Ring in the 1880s and was now the director of the New German Theater in Prague. The première duly took place at that theater on 15 November 1903, and was a triumphant success with the audience and the press (there were twenty-three curtain calls at the end, and altogether d’Albert was called to the stage more than forty times). But Germany’s theater directors were surprisingly unmoved, and publishers shied away from a work that boded a poor critical reception on the German stage. Under these circumstances Lothar again sold his rights to the libretto to d’Albert for a flat fee – a decision that he would live bitterly to regret. Convinced of the value of his work, and affluent from his superlative career as a concert pianist, d’Albert had the score printed at his own expense and invested 10,000 marks in its marketing – a phenomenally large sum at the time. Another performance was arranged for Leipzig on 17 February 1904; once again the audiences were more enthusiastic than critics. But d’Albert was able to persuade the Berlin-based publishing firm of Bote & Bock into accepting the work into their catalogue. This they did, but only on condition that he conflate the last two acts into one and make significant cuts. Thus arose the two-act version of Tiefland we know today, which was premièred at the unassuming Magdeburg City Theater on 16 January 1905. Other cities – Cologne, Mannheim – soon followed suit. But it was not until 1907 that the opera achieved its breakthrough in a staging by the adventurous impresario Hans Gregor at his private theater in Berlin, the Komische Oper. The success was breathtaking: within four months the work had been performed seventy times, always to a packed house, and on 27 January 1908 d’Albert himself was invited to conduct the one-hundredth performance. 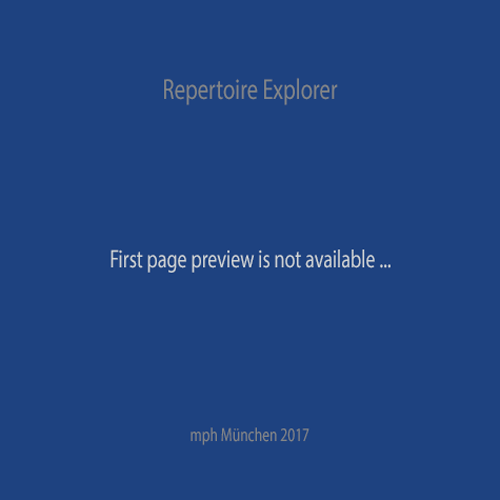 Altogether the Komische Oper staged four-hundred performances of an opera that had become, by operatic standards, a smash hit. By that time Tiefland was being mounted from one end of the German-speaking world to another, and it would go on to become one of the greatest and most frequently performed operas of the century. Even twenty years later it was heard more often on Germany’s stages than Carmen, Madame Butterly, Tosca, Der Rosenkavalier, or the perennial Cav & Pag. A glance at the theater statistics for the year 1927, nearly a quarter of a century after its creation, shows that it was given 296 performances on sixty-five stages, making it the most frequently heard of all modern operas in Germany – a position it held until 1930, when it was far outstripped by that “brilliant flash in the pan” (Marcel Prawy), Jaromír Weinberger’s Schwanda der Dudelsackpfeiffer. Unlike Schwanda, however, Tiefland never vanished entirely from the repertoire or stood in need of rediscovery. On the contrary, it persevered through the years of the Third Reich and the post-war collapse of the Germany economy and is still going strong today, as witness the recent performances at the Frankfurt Opera, the Tyrolean State Theater in Innsbruck, and the Nordhausen Theater (all 2014). It also made headway abroad: the American première was given at the New York Met in 1908 (with Emmy Destinn), and Tiefland went on in short order to conquer Antwerp, Riga, Stockholm, Budapest, Zagreb, Warsaw, Nice, Reval, Barcelona, St. Petersburg, Helsinki, Bucharest, Sofia, and Cairo. (Surprisingly, it has never been performed in Italy.) It helped to launch the careers of Kirsten Flagstad, who used it for her opera début in Oslo at the age of eighteen (1913), and Maria Callas, who sang Marta in Athens as a twenty-two-year-old in 1945-46. In a somber footnote to this stellar reception history, Tiefland was released in a film version conceived, produced, directed by and starring Leni Riefenstahl (1902-2003). Owing to the vicissitudes of German history and her own troubled biography, the shooting and production lasted from 1934 to 1954, earning it a place in the Guinness Book of Records as the live-action film with the longest production time in history. As many of the extras were Sinti and Roma who later perished in the concentration camps of Nazi Germany, the film has been tainted ever since with the Nazi brush, although more recently it has been reinterpreted by feminist critics as a gesture of protest against Nazi rule, with Riefenstahl (as Marta) liberating herself from the tyrannical rule of Sebastiano. As might be expected for an opera with such popular appeal, Tiefland has been extremely well-represented on disc. The first complete recording dates as far back as 1943, with Robert Heger conducting the chorus and orchestra of the Berlin State Opera. Of the twelve or more recordings that followed, pride of place must go to Marek Janowski’s reading of 1983, with the Munich Radio Orchestra and Chorus and with Eva Marton, René Kollo, and Bernd Weikl in the main roles. Other important releases include Bertrand de Billy’s CD recording of 2002 with the Vienna Radio Symphony Orchestra, and the DVD of a 2006 Zurich production conducted by Franz Welser-Möst with Petra Maria Schnitzer, Peter Seiffert, and Matthias Goerne. Though the musical language may seem thin and outdated compared to such contemporary opera composers as Franz Schrecker and Alexander Zemlinsky, much less Richard Strauss, there can be little doubt that Tiefland, Germany’s contribution to verismo, will continue to hold the stage with its effective dramaturgy, thrilling plot, and sumptuous score. Prelude, a meadow in the Spanish Pyrenees: High in the mountains, Pedro tends the cattle and sheep of his employer, the wealthy landowner Sebastiano. Many months have passed since he last saw a woman. Again and again he dreams of a beautiful woman who will share his solitary existence. He relates his dream to his friend Nando, another shepherd in Sebastiano’s employ whose path he occasionally crosses. Nando lights on an idea: throw a stone in the air, and the direction in which it falls will show where the creature of Pedro’s dreams will appear. His wish immediately becomes reality, for he sees his employer approaching from the valley, accompanied by the village elder Tommaso and a desirable young women. It is Marta, who works in Sebastiano’s mill. Sebastiano “bought” her from a vagabond when she was almost a child. Now she has come of age, and he has made her his lover. As this has led to gossip in the village, Sebastiano has concocted a devious plan: Marta shall enter a fictitious marriage with the naïve shepherd Pedro, for which Pedro shall receive the mill as her dowry. This will allow Sebastiano to marry the daughter of a wealthy peasant and to use her fortune to pay off his accumulated debts. Marta, being sexually submissive to Sebastiano, is horrified at this plan. She angrily sets out to return to the lowlands. Pedro, on the other hand, can hardly believe his luck. Thinking that God has given him a lifelong companion, he rushes after her. Act I, the interior of a mill: Pepa, Antonia, and Rosalia, all servants employed in the mill, ask the millworker Moruccio whether it’s true that Marta intends to marry. Moruccio becomes livid with rage, believing until now that he would be the bridegroom. When Marta’s young girlfriend Nuri enters, the three women surround her and learn that Marta is indeed to marry the naïve shepherd Pedro this very day. Now Marta enters and sends the gossipy maids outside. She despairs at the very thought of the marriage that her lord has devised for her. Though she despises Sebastiano, she is afraid to free herself from him. Moruccio knows the true reasons why his employer is forcing Marta to marry, and explains the situation to the village elder. At first Tommaso refuses to believe what he has heard and decides to ask Sebastiano himself at the next opportunity. Marta makes a final attempt to dissuade Sebastiano from his scheme. He refuses to change his mind. He even proclaims that he intends to keep her as his lover, for Pedro is a simpleton and incapable has satisfying a woman. He, Sebastiano, will slip into her chamber on the wedding night. When she sees light burning there, she is to come to him immediately. While Marta and Pedro walk to church with the villagers, a disturbance erupts in the mill: Moruccio rebels against his lord, who promptly dismisses him in his rage. Moruccio then vents his anger by telling the full truth to the assembled throng. Now the village elder realizes what is going on. Nonetheless, he is incapable of preventing the marriage from taking place. The newlywed couple has returned to the mill. Pedro shows his new wife the first silver real he ever earned, and describes how he earned it: a wolf had fallen upon the herd and attacked one of the sheep. But Pedro managed to kill the beast with his bare hands. For risking his life, Sebastian gave him the real. Marta is impressed, and her hatred toward Pedro gradually turns into fondness. When she sees light in her chamber, she decides to ignore it and to spend the night with Pedro in the sitting room. Act II, same as Act I: The next morning Pedro is plagued by ill thoughts. He cannot escape the feeling that he has been betrayed, and decides to find out the true nature of the relation between Sebastiano and his wife. Nuri tries to calm him, but when Marta sees the two together she is racked with something akin to jealousy and angrily chases Nuri out of the room. Pedro desperately runs after her. Marta pours out her heart to the village elder. She tells him about her childhood: she grew up without a father, her mother was blind, and fate led her into Sebastiano’s hands. During the night she realized that Pedro, far from being “bought” by Sebastiano, truly loves her. Now she too feels drawn to him. The aged Tommaso advises her not to keep secrets from her husband but to tell him the whole truth. Only in this way can she regain his trust. Pedro returns and gives Marta the cold shoulder. When he announces that he shall immediately return to the mountains, Marta begs him either to stay with her or to kill her. In his anger he wounds her with his knife. But suddenly he senses that Marta loves him. They fall into each other’s arms and resolve to flee to the mountains together. Just as they are about to leave, Sebastiano intervenes and once again desires Marta. The old scoundrel has learned that Tommaso has enlightened the father of his bride-to-be about his scheme and his relations to Marta. The planned marriage will never be. But at least he can keep Marta as a playmate. Pedro tries to protect his wife. Sebastiano is seized with wrath and sets upon Pedro. A violent life-and-death struggle ensues. But Sebastiano is the loser: Pedro strangles him just as he had once strangled the terrible wolf. There being nothing more to keep Marta and Pedro in the lowlands, they set out for the mountains together. For performance material please contact Bote und Bock, Berlin. Die Anfänge hätten kaum weniger glückverheißend sein können: Kurz vor der Jahrhundertwende spielte eine ungarische Gräfin mit der Idee, die weibliche Hauptrolle in Terra baixa („Tiefland“, 1896) – einem europaweit erfolgreichen anrüchig-naturalistischen Schaustück des katalonischen Nationaldichters Àngel Guimerà (1845-1924) – auf der Bühne zu bekleiden. Zu diesem Zwecke suchte die Gräfin vom erfahrenen wienerischen Theaterschriftsteller Rudolph Lothar (1865-1943) eine passende deutsche Übersetzung, die auch prompt geliefert wurde. Noch bevor die neue deutsche Fassung über die Bühne gehen konnte, hatte die Gräfin jedoch geheiratet und vom frischvermählten Ehemann das Verbot erhalten, in einem moralisch derart kompromittierenden Bühnenstück öffentlich zu erscheinen. Das Projekt scheiterte, Lothar erhielt für seine Arbeit einen Pauschbetrag ohne Aufführungsrechte, die Geschichte schien damit abgeschlossen zu sein. Dem war jedoch nicht so: Der Bühnentext wurde in der deutschen Theaterwelt zwecks möglicher Verwertung herumgereicht und gelangte auf diese Weise in die Hände des maßgebenden Theaterdirektors der Dresdner Hofoper und Strauss-Freund Ernst von Schuch, der sofort den Wert des Stücks als Opernstoff erkannte und nach einem dafür geeigneten Komponisten Ausschau hielt. Diesen fand Schuch im deutsch-englischen Komponisten und weltweit gefeierten Ausnahmepianisten Eugen d‘Albert. Als Librettist wurde besagter Rudolph Lothar beauftragt, der jedoch von Operntexten wenig wusste (es handelte sich dabei um sein erstes Operntextbuch überhaupt) und daher unter Anweisungen d’Alberts nur langsam vorankam. Dieser, der bereits auf sechs Opernwerke zurückblicken konnte, fieberte derart nach dem Libretto zu seiner siebenten Schöpfung, dass er Lothar sogar 50 Reichsmark für jeden Tag persönlich anbot, um den der Librettist die ausgemachte Lieferzeit kürzen konnte. Noch vor der Fertigstellung des Librettos machte sich d’Albert an die Kompositionsarbeiten (die ersten musikalischen Skizzen tragen als Entstehungsdatum den 22. April 1900); bereits am 24. Juli des gleichen Jahres wurde der ländlich-idyllische Prolog vollständig vertont, den Lothar als operngemäße Ergänzung zum stark naturalistischen Bühnenstück Guimeràs frei erfunden hatte. Während der Wartezeit auf das fertige Libretto suchte d’Albert einen wissenschaftlichen Fachmann für katalonische Volksmusik auf, um dem neuen Werk einen Anflug von musikalischer Realistik zu verleihen, die dem entlegenen ländlichen Schauplatz des Bühnenstücks vergleichbar wäre. Am 2. Juli 1903 lag die neue Oper Tiefland in ihrer ersten dreiaktigen Fassung endlich vor, und d’Albert bemühte sich, einen Theaterdirektor sowie einen Musikverleger ausfindig zu machen, die bereit wären, das neue Werk ins jeweilige Programm aufzunehmen. Die Suche gestaltete sich ausgesprochen schwierig: In der deutschen Musikwelt war das Interesse gleich Null. Schließlich konnte d’Albert jedoch fürs neue Projekt den risikofreudigen deutsch-slowakischen Theaterintendanten Angelo Neumann (1838-1910) gewinnen, der in den 1880er Jahren einen Ruf der Furchtlosigkeit mit einer Reiseinszenierung des Wagnerschen Ring des Nibelungen erlangt hatte und nunmehr als Leiter des Neuen Deutschen Theaters in Prag fungierte. Dort fand die Uraufführung der dreiaktigen Fassung von Tiefland am 15. November 1903 auch statt, und zwar mit glänzendem Erfolg bei Presse und Publikum zugleich (am Ende der Vorstellung gab es 23 Vorhänge, im Laufe des Abends wurde d’Albert insgesamt über 40mal auf die Bühne gerufen). Die Theaterleiter in Deutschland zeigten sich hingegen immer noch wenig begeistert, und die Verleger machten einen großen Bogen um ein Werk, das eine womöglich skandalöse Aufnahme im deutschen Blätterwald riskierte. Unter diesen wenig erfolgversprechenden Umständen verkaufte Lothar erneut für einen Pauschbetrag seine Aufführungsrechte an den Komponisten d’Albert – eine Entscheidung, die er letztendlich bitterlich bereuen sollte. Der vom hohen Wert der neuen Oper überzeugte, durch seine glänzende Pianistenkarriere reich gewordene d’Albert hingegen ließ die Partitur auf eigene Kosten drucken und investierte die damals phänomenal hohe Summe von 10.000 Reichsmark in die Vermarktung des neuen Werks. Am 17. Februar 1904 ertönte in Leipzig eine nochmalige Inszenierung des Tiefland, die jedoch von den Zuschauern weitaus freundlicher als von der Presse aufgenommen wurde. Dennoch gelang es d’Albert zumindest, das Berliner Verlagshaus Bote & Bock zur Aufnahme des Werks in das Verlagsprogramm zu überreden, allerdings unter der verlagsseitigen Bedingung, dass wesentliche Kürzungen vorgenommen und die beiden letzten Akten in einen einzigen zusammengefasst werden sollten. So entstand die heute bekannte zweiaktige Fassung von Tiefland, die am 16. Januar 1905 am wenig bedeutsamen Magdeburger Stadttheater auch uraufgeführt wurde. Weitere deutsche Theater (Köln, Mannheim) schlossen sich bald an. Jedoch erst im Jahre 1907 konnte das nicht mehr ganz neue Werk den endgültigen Durchbruch erleben, und zwar in einer Inszenierung durch den wagemutigen Theaterleiter Hans Gregor in der von ihm privat geführten Komischen Oper Berlin. Diesmal ließ der Erfolg alle Erwartungen weit hinter sich: Innerhalb von vier Monaten war Tiefland bereits 70mal in dem immer ausverkauften Haus der Komischen Oper aufgeführt, am 27. Januar 1908 durfte der Komponist auf Einladung des Theaters die 100. Aufführung selber dirigieren. Insgesamt wurde die Gregor-Inszenierung rund 400mal gespielt, und Tiefland wurde zu einem (nach operngeschichtlichen Maßstäben) riesigen Kassenschlager. Bald wurde Tiefland von einem Ende der deutschsprachigen Theaterwelt bis zum anderen inszeniert und auf diese Weise zu einem der erfolgreichsten und meistaufgeführten Opernwerke des 20. Jahrhunderts. Sogar 20 Jahre später konnte sich Tiefland mehr Inszenierungen auf mehr deutschen Bühnen erfreuen, als es etwa Carmen, Madame Butterfly, Tosca, Der Rosenkavalier oder die unverwüstlichen Cavaleria rusticana/Pagliacci zu schaffen vermochten. Ein Blick auf die Theaterstatistik fürs Jahr 1927 – ein ganzes Vierteljahrhundert nach seiner Entstehung – zeigt beispielsweise für Tiefland sage und schreibe 296 Vorstellungen auf insgesamt 65 Bühnen, wobei das Werk zur meistaufgeführten modernen Oper der deutschsprachigen Bühne überhaupt wurde – eine Vorrangstelle, die es bis zum Aufkommen der „glänzenden Eintagsfliege“ (Marcel Prawy) Schwanda der Dudelsackpfeiffer von Jaromír Weinberger im Jahre 1930 auch innehielt. Anders als Schwanda ist Tiefland jedoch nie aus dem Opernrepertoire gänzlich verschwunden und bedurfte nie einer Wiederentdeckung. Im Gegenteil: Die Erfolgssträhne hielt durch die düsteren Jahre des Dritten Reichs sowie durch den wirtschaftlichen Kollaps des Nachkriegsdeutschlands an und ist bis heute noch nicht abgebrochen, wie etwa in den neuerlichen Inszenierungen an der Frankfurter Oper, des Tiroler Landestheaters Innsbruck oder des Theater Nordhausen im Jahre 2014 deutlich zu erkennen ist. Auch im Ausland war Tiefland erfolgreich: Die US-amerikanische Erstaufführung fand an der New Yorker Metropolitan Opera bereits 1908 mit Emmy Destinn statt, und binnen kurzem konnte der Opernliebhaber das Werk auch in Antwerpen, Riga, Stockholm, Budapest, Zagreb, Warschau, Nizza, Reval, Barcelona, St. Petersburg, Helsinki, Bukarest, Sofia und Kairo erleben (seltsamerweise ist Tiefland noch nie in Italien aufgeführt worden). Auch diente das Werk als Karrierensprungbrett für Kirsten Flagstad, die 1913 mit nur 18 Jahren ihr Bühnendebüt in einer Osloer Inszenierung gab, und auch für Maria Callas, die 1945/46 mit 22 Jahren die Rolle der Marta in Athen bekleidete. In einer etwas düsteren Fußnote zu seiner glanzvollen Rezeptionsgeschichte wurde das Werk auch in einer Filmfassung mit Leni Riefenstahl (1902-2003) als treibende Kraft, Produzentin, Regisseurin und Hauptdarstellerin verewigt. Durch die Umwälzungen der europäischen Geschichte sowie ihres eigenen bewegten Lebens dauerten die Dreh- und Produktionszeiten von 1934 bis 1954 an, was dem Film einen Platz im Guinness-Buch der Rekorde als Realfilm mit der längsten Entstehungszeit der Geschichte sicherte. Da viele der darin beschäftigten Statisten/-innen zur Bevölkerungsgruppe der Sinti und Roma gehörten und später in den Konzentrationslagern des Nazi-Deutschlands ermordet wurden, haftet dem Film bis heute der Makel der Nazivergangenheit an, auch wenn er neuerdings von Feministinnen eher als Versuch einer Auflehnung gegen die Naziherrschaft interpretiert wird, wobei sich Riefenstahl als Marta von der Gewaltherrschaft des Sebastiano befreit. Wie bei einer Oper von solcher Popularität kaum anders zu erwarten wäre, ist Tiefland auf Tonträgern ausgesprochen gut vertreten. Auf die erste Gesamtaufnahme, die bereits 1943 durch Robert Heber mit dem Chor und Orchester der Berliner Staatsoper aufgezeichnet wurde, folgten mindestens 12 weitere Gesamteinspielungen, von denen die 1983 von Marek Janowski mit dem Münchner Rundfundchor und -orchester sowie den Sängern Eva Marton, René Kollo und Bernd Weikl aufgenommene besonders herausragt. Zu den weiteren beachtenswerten Einspielungen gehören die CD-Aufnahme von Bertrand de Billy mit dem Wiener Rundfunksinfonieorchester (2002) sowie die von Franz Welser-Möst geleitete DVD-Aufzeichnung einer Zürcher Inszenierung mit Petra Maria Schnitzer, Peter Seiffert und Matthias Goerne (2006). Auch wenn das musikalische Idiom gegenüber der zeitgenössischen Opernsprache eines Franz Schreker oder eines Alexander Zemlinsky, geschweige denn der von Richard Strauss, eher vergilbt wirken kann, ist kaum daran zu zweifeln, dass der deutsche Beitrag zum Verismo – Tiefland – mit seiner wirkungsvollen Dramaturgie, seiner packenden Handlung sowie seiner farbenreichen Partitur einen festen Platz im deutschen Opernrepertoire auch weiterhin behaupten wird. Vorspiel, Hochalpe in den spanischen Pyrenäen: Pedro steht im Dienste des reichen Gutsbesitzers Sebastiano und hütet hoch oben in den Pyrenäen dessen Rinder und Schafe. Schon viele Monate sind vergangen, seit er das letzte Mal eine Frau gesehen hat. Immer wieder träumt er von einer Schönen, die mit ihm die Einsamkeit teilt. Dies erzählt er auch seinem Freund Nando, der auch einer von Sebastianos Hirten ist und den er hier oben hin und wieder antrifft. Nando kommt die Idee, einen Stein in die Luft zu schleudern. Aus der Richtung, die der Kiesel einschlägt, möge dann das Wesen von Pedros Fantasie erscheinen. Der Wunsch geht auch sogleich in Erfüllung, denn vom Tal herauf sieht er seinen Arbeitgeber nahen, begleitet vom Dorfältesten Tommaso und einer begehrenswerten jungen Frau. Es ist Marta, die in Sebastianos Mühle arbeitet. Als sie noch fast ein Kind war, „erkaufte“ sie Sebastiano von einem Landstreicher, und als sie zur Frau heranreifte, machte er sie zu seiner Geliebten. Weil darüber das Getuschel der Leute im Dorf nicht aufhört, hegt er einen aberwitzigen Plan: Marta soll zum Schein den naiven Hirten Pedro heiraten. Als Mitgift soll Pedro die Mühle erhalten. Auf diese Weise werde für Sebastiano der Weg frei, die Tochter eines reichen Bauern zu heiraten, um mit deren Vermögen seine aufgelaufenen Schulden begleichen zu können. Marta ist alles andere als erfreut, weil sie Sebastiano hörig ist. Wütend macht sie sich auf den Weg zurück ins Tiefland. Pedro hingegen kann sein Glück kaum fassen. Er glaubt, Gott habe ihm eine Lebensgefährtin zugeführt. Rasch läuft er ihr nach. I. Akt, im Innern der Mühle: Die in der Mühle beschäftigten Mägde Pepa, Antonia und Rosalia wollen vom Mühlknecht Moruccio wissen, ob es stimme, dass Marta heiraten solle. Moruccio ist jedoch wütend, weil er bis heute geglaubt hat, er selbst wäre der Auserwählte. Als die junge mit Marta befreundete Nuri hinzukommt, stürzen sich die drei auf diese und erfahren nun, dass Marta noch heute mit dem naiven Hirten Pedro vermählt werden soll. Marta betritt auf und schickt die geschwätzigen Mägde fort. Wenn sie an die von ihrem Herrn gewünschte Heirat denkt, ist sie nah am Verzweifeln. Einerseits verachtet sie Sebastiano, aber andererseits fürchtet sie, nicht von ihm loszukommen. Moruccio kennt die wahren Gründe, weshalb sein Dienstherr Martas Hochzeit mit Pedro forciert, und klärt den Gemeindeältesten darüber auf. Dieser will zunächst gar nicht glauben, was er da hört. Er will bei Gelegenheit Sebastiano selbst befragen. Marta unternimmt einen letzten Versuch, Sebastiano von seinem Vorhaben abzubringen. Der aber lässt sich nicht umstimmen. Er erklärt ihr sogar, sie weiterhin als seine Geliebte zu halten; denn Pedro sei ein Einfaltspinsel und eh nicht in der Lage, eine Frau zu befriedigen. Noch in der Hochzeitsnacht werde er, Sebastiano, in ihre Kammer kommen. Wenn sie dort Licht sehe, solle sie ihn gleich dort aufsuchen. Während Marta und Pedro mit den Dorfbewohnern zur Kirche ziehen, kommt es in der Mühle zu einem Eklat: Moruccio begehrt gegen seinen Herrn auf. Als dieser ihm wutentbrannt kündigt, macht Moruccio seiner Seele Luft, indem er die ganze Wahrheit aus sich herausschleudert. Nun erkennt auch der Dorfälteste, was hier gespielt wird. Trotzdem kann er nicht mehr verhindern, dass die Trauung vollzogen wird. Das frisch vermählte Paar ist in die Mühle zurückgekehrt. Pedro zeigt seiner Angetrauten seinen ersten Taler, den er sich selbst verdient hat, und schildert, wie das geschah. Ein Wolf war in die Herde eingefallen und eines der Schafe gerissen. Pedro aber gelang es, mit seinem Messer das wilde Tier zu töten. Weil er sein Leben riskiert hatte, erhielt er von Sebastiano den Taler. Marta zeigt sich beeindruckt. Langsam wandelt sich ihr Hass auf Pedro in Sympathie. Als sie bald darauf Licht in ihrer Kammer sieht, ignoriert sie dieses Zeichen und verbringt die Nacht mit Pedro in der Wohnstube. II. Akt, wie beim ersten Akt: Tags darauf wird Pedro von quälenden Gedanken heimgesucht. Irgendwie wird er das Gefühl nicht los, betrogen worden zu sein. Er will herausbekommen, welches Verhältnis zwischen Sebastiano und seiner Gattin besteht. Nuri versucht, ihn zu beruhigen. Als aber Marta die beiden sieht, kommt so etwas wie Eifersucht in ihr hoch. Wütend jagt sie Nuri aus der Stube. Der verzweifelte Pedro eilt ihr hinterher. Marta schüttet ihr Herz dem Dorfältesten aus. Dabei erzählt sie ihm auch aus ihrer Jugendzeit, dass sie ohne Vater aufwuchs, ihre Mutter blind war und wie sie das Schicksal zu Sebastiano geführt hat. In der Nacht habe sie Gewissheit erlangt, dass Pedro nicht von Sebastiano „gekauft“ worden sei, sondern dass er sie aufrichtig liebe. Auch sie fühle sich jetzt zu ihm hingezogen. Der alte Tommaso empfiehlt ihr, vor ihrem Mann keine Geheimnisse mehr mit sich herumzutragen, sondern ihm die volle Wahrheit zu erzählen. Nur auf diese Weise könne es gelingen, dass er wieder Vertrauen zu ihr fasse. Pedro kehrt zurück und zeigt Marta die kalte Schulter. Als er dann noch ankündigt, gleich hinauf ins Hochland zu gehen, fleht Marta ihn an, entweder bei ihr zu bleiben oder aber sie zu töten. In seiner Wut verletzt er sie mit seinem Messer. Plötzlich aber fühlt er, dass Marta ihn liebt. Sie sinken sich in die Arme und fassen den Entschluss, gemeinsam in die Berge zu gehen. Als sie aufbrechen wollen, kommt Sebastiano dazwischen und begehrt Marta erneut. Der alte Gauner hat inzwischen erfahren, dass Tommaso den Vater seiner Braut über seine Machenschaften und sein Verhältnis zu Marta aufgeklärt hat, so dass aus der geplanten Hochzeit nichts mehr wird. So will er wenigstens Marta als Gespielin behalten. Pedro will seine Frau beschützen. Da packt Sebastiano der Zorn und er schlägt wütend auf diesen ein. Es kommt zu einem heftigen Kampf auf Leben und Tod. Dabei zieht Sebastiano den Kürzeren. Er wird von Pedro erdrosselt, wie dieser einst den furchtbaren Wolf erwürgt hat. Marta und Pedro hält jetzt nichts mehr im Tiefland. Gemeinsam ziehen sie hinauf ins Gebirge. Aufführungsmaterial ist von Bote und Bock, Berlin, zu beziehen.